Thank you for purchasing our theme. If you have any questions that are beyond the scope of this help file, please feel free to email via our support forum by clicking here. Thanks so much! Installing the theme is easy. Purchase a copy of the theme from ThemeForest, then go to you Downloads page, then click the “Download” button and choose “Installable WordPress ZIP file” and save that ZIP file to your desktop. 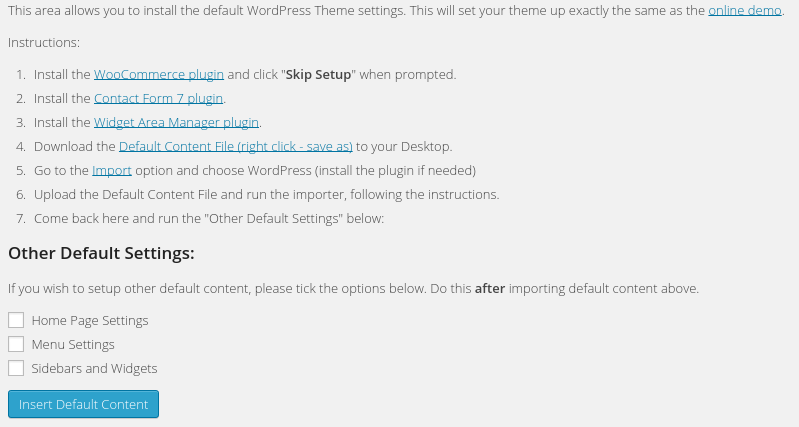 Login to your wordpress blog, click the “Appearance” tab, click the “Themes” tab, click the “Install Themes” tab, click the “Upload” button, click “Browse” to select the ZIP file you just downloaded. Click “Install Now”. Once the theme is installed you will be asked to install the recommended plugins. Follow the prompts as per the video. Install and activate the plugins. Important: Once the theme is uploaded and installed, click on the new “Options: Envato” menu item underneath “Appearance” and enter your License Purchase Code which is available in the “Download > License Certificate” option. 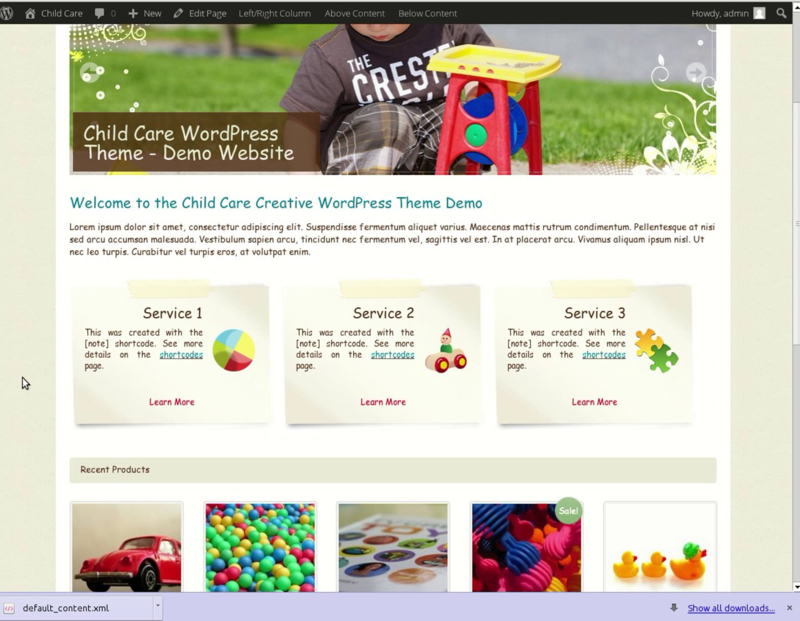 This theme comes with default content. As per the video, please go to Appearance > Default Content and follow the prompts. This is a very quick process and will result in a theme that matches the demo site. If you have any trouble setting up the default content then please send us a support ticket and we can assist. The CSS for this template is all in two files. The main CSS file is called style.css, and the other stylesheet is just for the shop, called style.woocommerce.css. Each section of these stylesheets is separated by comments to make it easier for you to change where needed. This site is setup to use Cufon and Google fonts. You can change these font options in the “Appearance” > “Options: Font” area. Try out the different available fonts to see which you like best. Setting up the wordpress home page is easy. Simply go to the “Settings” » “Reading” and select static page as home page, then select your Home page from the drop down list. You do not need to select a blog page from the drop down list. Then go to your home page and edit it, on the right select the “Home Page” template from the drop down list. All done! As per the video, go to Appearance > Widgets and drag the ‘Home Page Slider’ widget to the ‘Home Slider’ sidebar on the right. 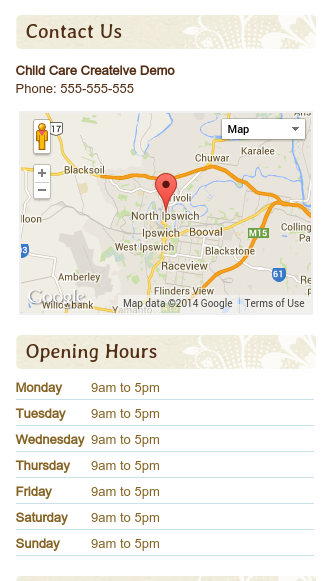 From the drop down list choose a page that has a normal wordpress image gallery on it. 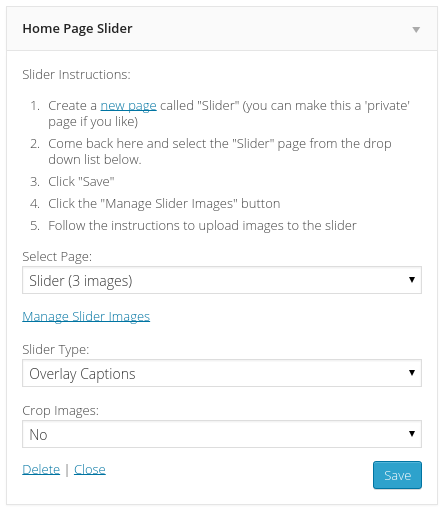 The images in this wordpress gallery will display as your slider. Follow the instructions in the widget for more details. The menu in this theme is controlled by standard WordPress menus. Please go to the “Appearance” > “Menus” tab to setup the menu. Consult wordpress documentation on how to setup a menu. Click on Appearance > Widgets. There is a “Contact Us” widget there. This will display contact details in a sidebar. /css/nivo-slider.css – CSS file for the main slider as seen on the demo home page. /css/flexslider.css – CSS file for the alternative slider as seen on the alt slider demo page. 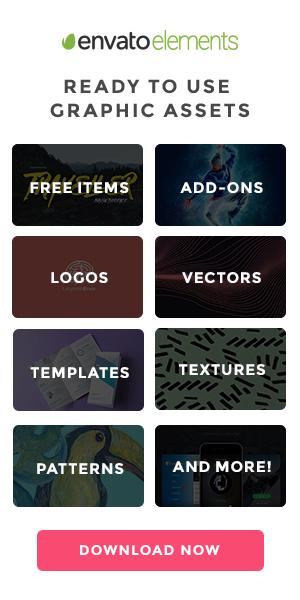 /images/ – this folder contains all the graphics used in the design. The easiest/quickest way to adjust the design is to open an existing image from this folder in PhotoShop and replace it with a new one the same size. More advanced changes can be made in the provided PhotoShop files however this may require more advanced web development skills. /shortcodes/ – this folder contains the code for the 4 available shortcodes: banner, fancy_post, google_map and note – these are shown on the shortcode demo page. /404.php – displayed when a page cannot be found on the website, example. /archive.php – displayed when on a date archive page on the blog, example. /category.php – displayed when viewing a blog category, example. /class-tgm-plugin-activation.php – used to automatically install plugins on theme activation, don’t edit this file. /content.php – this outputs the individual blog summary entries, example. /content-page.php – this controls the output of an individual page, example. /content-single.php – this controls the output of an individual blog post, example. /default_content.xml – this is the default content used when setting up the demo content. /index.php – controls the main blog page layout, example. /page.php – controls individual page layouts (in conjunction with content-page.php), example. /search.php – shows search results, example. /single.php – controls invididual blog page layouts (in conjuction with content-singe.php), example. /template-home.php – used on the home page, select “Home” from the page template sidebar. Here are some instructions on more advanced feature modifications. If you are a web developer and need assistance with a custom change please send us a support ticket. We are unable to perform custom modifications for you but we can point you to the right file that needs changing. 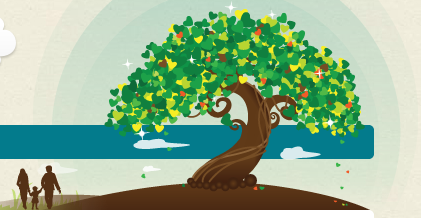 The header graphics (tree/grass) is made up of 3 images, these are: Tree, Circles and Grass The easiest way to edit these files is to open the desired image in Photoshop, change it and then upload it over the top of the old image in the theme images/ folder. The photoshop files contains clearly named folders for each part of the website. The Photoshop documents have the slices required to build the layout. Pay special attention to the images that are saved as PNG, these ones need to be transparent and have nothing behind them when you save. Some slice boxes overlap, you can move slices into the background or bring them to the foreground using the slice options in the top left of the tool bar. You may need to hide some of the backgrounds and text when saving certain images. Use the existing images as a guide. To export the images go to: File > Save for Web, click on the slice you want to export and click save at the bottom of the screen, all the correct image settings will already be there, overwrite the originals in the images folder. I’ve used the following images, icons or other files as listed. Extra font: I used Trebuchet MS & Arial for the standard text. Once again, thank you so much for purchasing this theme. As I said at the beginning, I’d be glad to help you if you have any questions relating to this theme. No guarantees, but I’ll do my best to assist. If you have a more general question relating to the themes on ThemeForest, you might consider visiting the forums and asking your question in the “Item Discussion” section.